Communities, Cultures, Religions and Customs of different hues intermingle freely here in Sikkim to constitute a homogeneous blend. The predominant communities are the LEPCHAS, BHUTIAS and NEPALESE. In urban areas, many plainsmen have also settled and they are almost engaged in business and Government service. Because of the development activities in the state, like the construction of roads, bridges and buildings a small part of the population consists of migrant laborers from the plains and Nepal. The original inhabitants of Sikkim are said to be Lepchas. They existed much before the Bhutias and Nepalese migrated to the state. Before adopting Buddhism or Christianity as their religion, the earliest Lepcha settlers were believers in the bone faith or mune faith. This faith was basically based on spirits, good and bad. They worshipped spirits of mountains, rivers and forests which was but natural for a tribe that co-existed so harmoniously with the rich natural surroundings. The Lepcha (Zongu) folklore is rich with stories. The Lepcha population is concentrated in the central part of the Sikkim. This is the area that encompasses the confluence of Lachen and Lachung rivers and Dickchu. Life in a Lepcha dwelling is very simple. The male Lepcha wears a dress called a “pagi” made of cotton, which is stripped. 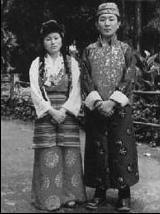 The female Lepcha wear a two piece dress. The Lepchas speak the language lepcha, although this language is not very well developed but is rich in vocabulary related to the flora & fauna of Sikkim. Lepchas are very good at archery. 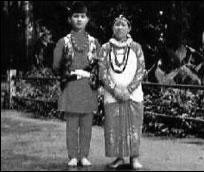 The polyandry marriages are permitted amongst the Lepchas. These are the people of Tibetan origin. 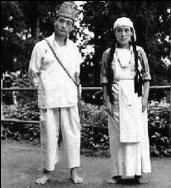 They migrated to Sikkim perhaps somewhere after the fifteenth century through the state of Sikkim. In Northen Sikkim, where they are the major inhabitants, they are known as the Lachenpas and Lachungpas. 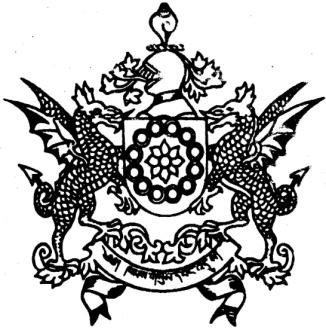 The language spoken by the bhutias is sikkimese. Bhutia villages are as large as those compared to those of Lepchas. A Bhutia house called “Khin” is usually of rectangular shape. The traditional dress of the male member is known as the “Bakhu” which is a loose cloak type garment with full sleeves. The ladies dress consists of a silken “Honju” which is a full sleeve blouse and a loose gown type garment. The ladies are very fond of heavy jewelry made of pure gold. The Nepalese appeared on the Sikkim scene much after the Lepchas & Bhutias. They migrated in large numbers and soon became the dominant community. The Nepalese now constitute more than 80% of the total population. The Nepali settlers introduced the terraced system of cultivation. Cardamom was an important cash crop introduced by the Nepalis’. Except for the Sherpas & Tamangs who are Buddhists, the Nepalis’ are orthodox Hindus with the usual cast system.